Diesel engines are widely used in agricultural machinery, vehicles, and ships because of their high thermal efficiency. The sulfur contained in the diesel fuel is oxidized to sulfur dioxide by combustion. This sulfur dioxide not only harms human health but also causes deactivation of the catalysts used to treat NOx in the exhaust stream. This problem can be overcome by using sulfur-free fuels based on biomass or clean coal technology or by installing a desulfurizing filter to remove sulfur oxides upstream of the NOx catalyst. Researchers at Kanazawa university have developed a plasma-assisted MnO2 filter that produces exhaust free of NOx and SOx. This technology augments the desulfurization properties of MnO2 with the activity of ozone from an atmospheric-pressure non-equilibrium plasma (Figure 1). Activated chemical species (O3, OH radicals, etc.) present in the plasma promote desulfurization and denitration reactions. MnO2 reacts with sulfur and nitrogen oxides to produce sulfates and nitrates, respectively. The interaction between SO2 and NO2 degrades the performance of MnO2 catalysts in eliminating both species. 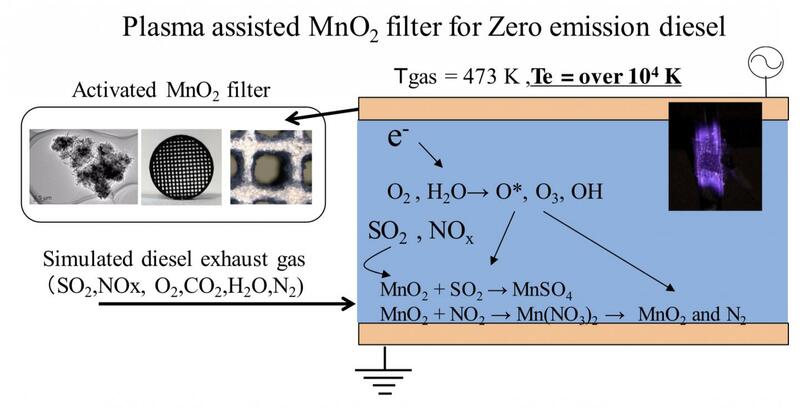 Prof Huang of the Guangzhou Institute of Energy Conversion analyzed the MnO2 catalyst material after exposure to simulated exhaust gas containing both SO2 and NO2 and found that both manganese nitrate and manganese sulfate were produced. We evaluated the impact of ozone on the performance of the catalyst for SO2 and NO2 removal (Figure 2). An atmospheric-pressure non-equilibrium plasma was generated by the dielectric barrier discharge method. The performance of the catalyst in eliminating both SO2 and NO2 was improved by the introduction of ozone at a low concentration of about 50 ppm. The enhancement in NO2 elimination was particularly notable. The introduction of ozone seems to give a reaction to reduce nitrogen oxides to nitrogen. At the initial stage of the reaction, over 99% of SO2 and NO2 were removed from the exhaust stream. The Kanazawa University researchers, led by Yugo Osaka, demonstrated for the first time that zero emissions of NOx can be achieved even in the presence of sulfur oxides by using a plasma-assisted MnO2 filter. The plasma-assisted filter seems to augment the elimination of SO2 because of SO3 generation and also reduce nitrogen oxides to nitrogen. These findings are expected to be widely applicable in the purification of exhaust from diesel engines using sulfur-containing fuels. We have clarified the mechanism by which the induction of the non-equilibrium plasma augments the performance of the MnO2 filter. We hope to spur further development of plasma-assisted MnO2 filters and thus allow for a greater diversity of fuels to be used without adversely impacting air quality.